Submitted photo The historic town of Osborne in the 1910’s. Osborne was locate on what is now Wright-Patterson Air Force Base’s flight line. A group of trees in the upper right corner marks Cox Family Cemetery, which today sits inside a white picket fence on the flight line. WRIGHT-PATTERSON AIR FORCE BASE — Having endured the elements, limestone grave markers eventually lose their inscriptions and crumble into dust. Many of the gravestones in the two historic cemeteries on Wright-Patterson Air Force Base have done just that. In fact, the Landis-Shank Cemetery holds eight graves, but only four grave markers. The Landis-Shank plots, currently near the tenth hole of the Prairie Trace Golf Course, were relocated from their original place of rest, to allow for construction. The graves were originally located where Building 262, Air Force Materiel Command Headquarters, now stands. Originally named the Hebble Creek Cemetery, the Landis-Shank Cemetery was relocated in 1941 and renamed to honor the dead buried there. Great care was taken not to damage the wood coffins, though at the time some of the grave stones were already broken. Cox Family Cemetery, the larger of the two burial plots, is thought to contain up to 80 graves but has less than 40 visible tombstones. The most notable of these stones is one marking the grave of Hiram Honaker, a black Civil War veteran. The stone marking Honaker’s grave is new; it was placed in 1971 to honor Honaker after his original tombstone had faded into obscurity. Honaker served in Company A of the 5th United States Colored Calvary. Honaker is buried alongside his daughter, Lucy, and is thought to have been a family friend of the Cox’s. This cemetery was part of the 690-acre Cox farm, home to one of the wealthiest families in the historic town of Osborn. The cemetery, and most of the farm, are now part of the flight line. The cemetery is protected by a white picket fence. 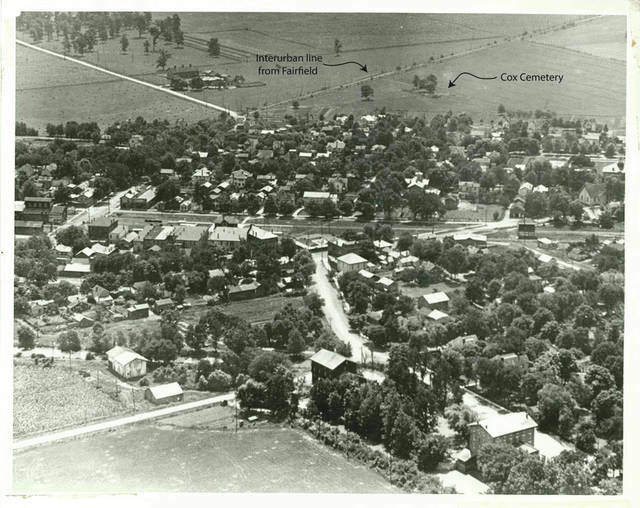 Cox Family Cemetery has withstood not only the passing of time, but a catastrophic event that reshaped the area around Wright-Patterson. Woodruff, in collaboration with the National Park Service’s Midwest Regional Archaeology Center and the Air Force Civil Engineering Center, is working to bring back the history of these cemeteries lost to time. “Our work at the cemetery is part of a larger project. We’re working at not only Cox Cemetery, but also at the neighboring historic town of Osborn,” said Adam Wiewel, an archeologist with the MRAC. As part of a multi-year project to reconnect with the history of Wright-Patterson Air Force Base, the MRAC is conducting surveys of Cox cemetery, as well as areas of the airfield that used to comprise the town of Osborne. “The instruments we are using are used by archeologist to look for sub-surface features. These features can be anything from sidewalks to house foundations, or in the cemetery obviously burials or graves,” said Wiewel. Though they are long gone, the people of Osborn leave a legacy. https://www.xeniagazette.com/wp-content/uploads/sites/32/2018/10/web1_181001-F-ME052-1004.jpgSubmitted photo The historic town of Osborne in the 1910’s. Osborne was locate on what is now Wright-Patterson Air Force Base’s flight line. A group of trees in the upper right corner marks Cox Family Cemetery, which today sits inside a white picket fence on the flight line.